If there’s one thing you can’t be without once you clock in, it’s a high-quality pair of work boots. They’re essential no matter what industry you’re in. The right pair of work boots will keep you safe from whatever the job throws at you and ensures that you stay comfortable the entire work day. With that being said, not all work boots are made the same. The best pair of work boots for you will depend entirely on a few different factors. These factors include the type of work you’ll be doing while you wear them, what type of environment you’re in, and whether or not you suffer from a medical condition that needs special attention. It’s important to take these considerations into account when looking for the right pair of boots. Certain design elements and materials are great for one job but can prove to be dangerous for another. To find out what work boots are best for your particular needs and jobs, pick a selection in the overview below that applies to your current situation. These boots can serve you well in a range of work environments. They utilize tough leather on the uppers, a unique rubber compound on the soles, and include a host of safety features throughout. They’re an ideal all-purpose boots thanks to the broad protection they offer. Construction workers, carpenters, delivery drivers, and forestry workers will benefit the most. The steel toe cap and diffusion plate provide some much-needed support and safety for anyone working on their feet around dangerous equipment. With the thick leather uppers, these boots are best for moderately warm environments. While it doesn’t have any ventilation holes for increased air circulation, the interior lining is antimicrobial. This will help to keep odors under control as you sweat. It can also keep you safe in wet environments thanks to its slip and oil-resistant soles. A polyurethane midsole is used to provide you with ample arch support. These boots are designed for all-day wear and include plenty of comfort padding throughout. Breaking these boots in is fairly easy to do but can take up to a week to get the job done. However, once it’s done, you’ll be able to get a snug and comfortable fit each time. The Second Shift boots from Caterpillar offer broad protection from many common hazards that are present on the job site. They were designed with versatility and all-purpose protection in mind. With high-quality leather uppers and a traction outsole, these boots will keep you stable and safe. With a steel toe cap and oil-resistant outsole, you can take these work boots with you to a wide variety of jobs. They’re best suited for the construction trade. 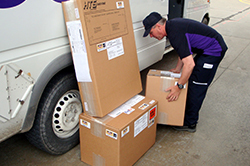 They can also perform well for delivery drivers and anyone that works around heavy items that could cause potential toe injuries. These boots are best in relatively warm and dry environments. They can keep you upright around light oil spills. If you’re on uneven terrain, the steel shank inside the sole will add stability as you walk. It also has a mesh lining to enhance breathability in warmer conditions. 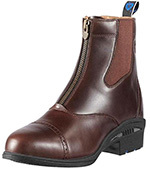 The Second Shift boots feature a prominent heel with pronounced lugs. The thick sole shape adds rigidity as you walk and supports your arch. There’s also a removable PU sock liner that’s designed to give you the comfort you need to make it through the day. The break-in period for most workers is a few days. The upper leathers need to be conditioned and worked in so that they can mold to your feet. These boots from Caterpillar are designed to work with your feet, not against them. They’re designed to give you the full range of motion and foot control that you need in even the toughest environments. With the strong sealed construction method that keeps water out, you can continue working in rain or snow. The waterproof boots are great for forestry workers, farmers, and anyone else that works outside in wet areas. It may also serve plumbers and firefighters well, but it’s not specifically designed to improve traction on slick surfaces. 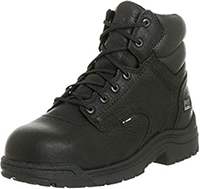 In addition to its waterproofing, the boots also have a steel toe cap built in, expanding their possible uses. If you work in the mud or snow, these boots are ideal. They can keep you warm even when you’re surrounded by ice. Inside the boots, you’ll find 200g Thinsulate. This insulation will regulate your body temperature while the waterproofing seal keeps moisture and grime out. An EVA foam insert is included with these boots. They incorporate some gel technology and are completely removable for easy maintenance. The rigid rubber sole can also enhance comfort, as it keeps your foot in a stable position as you make your way over rough terrain. As with any boot, the Diagnostic boots do require a few days to break in. 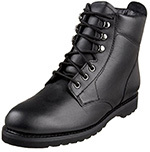 However, many workers praise the relatively short break-in period compared to other boots. The boots have a more contour shape than other options, so the task is quite easy. 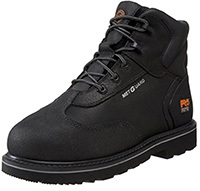 The Met Guard boots from Timberland are built to exceed ASTM safety standards for compression resistance, impact, and metatarsal impact. They’re designed to create a safe cocoon around your foot to protect it from a wide range of different hazards. As a result, they’re a great all-purpose option that can be used in many different work settings. The metatarsal guard, steel toe, and steel shank make it ideal for those working in construction. It offers versatility and broad protection. With its slip and oil-resistant sole, it’s a beneficial footwear option for concrete workers, plumbers, and delivery drivers. There’s also self-extinguishing stitching, making it safe for welders working around flying sparks. These boots will keep workers in moderate climates comfortable. they feature an antimicrobial lining, so if you do sweat, you won’t have to deal with the odors later. They can also perform well in slightly wet environments, but it doesn’t have full waterproofing features. Numerous comfort features are built right in. Contoured polyurethane is used on the footbed. The metatarsal guard is also anatomically contoured, so you won’t have to worry about discomfort as you move. Due to the Goodyear Welt construction method, these boots will take a few days to break in. Luckily, the contoured interior and flexible leather uppers ensure that you won’t have to go to extremes to get a comfortable fit. 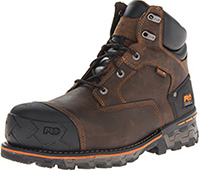 The Irish Setter’s work boot has a classic design and a host of safety features. It utilizes a moc-toe style and features durable stitching throughout so that it can serve you well for years to come. It also offers great foot support, allowing you to work all day without feeling the effects later. These boots meet ASTM electrical hazard safety standards. The thick rubber EVA sole will keep electricians grounded as they work. Farmers and other workers that spend a lot of their time outdoors will also benefit from wearing these boots thanks to the unique traction tread design that works to keep you stable. The uppers are made of waterproof full grain weather, so you can work in wet environments with no problem. The wedge-style sole will provide you with some additional support. 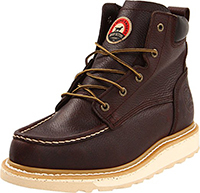 It also uses Goodyear Welt construction, so you don’t have to worry about water getting in. A comfortable nylon woven lining is used to prevent chaffing. There’s also an EVA midsole and a removable PU footbed. These interior features are designed to keep your feet cushioned as you work. They also provide some much-needed support to ensure that you can maintain good joint health. Due to its unique construction and design, these boots have a very minimal break-in period. The uppers are relatively pliable despite the strong material used. 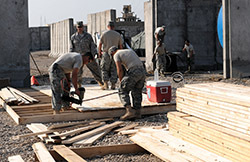 The work environment of construction sites is riddled with hazards. Work boots should have durable toe caps and metatarsal guards to prevent crushing injuries. Boots should also be shock-resistant to avoid injuries from equipment and live electrical wiring. A puncture-resistant plate is also recommended to keep the bottom of the foot safe. 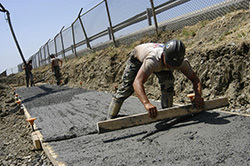 When working with concrete, it’s important to stay safe from falling objects and slipping. A non-slip sole with waterproofing features will provide stability and comfort when working with wet concrete while a steel toe cap and plate will protect from falling hard concrete. If you’re walking on concrete all day, it’s also good to get boots with ample padding and comfort features. 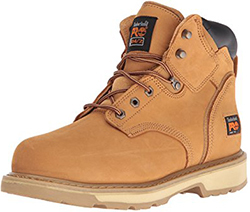 The best type of work boot for carpenters will provide good general protection and comfort. Steel toe caps and a metatarsal shield can keep the feet safe from falling equipment. Durability is also key, so boots should be made from thick materials that are resistant to tears. 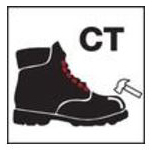 Boots for roofers should be resistant to punctures from fasteners and debris. 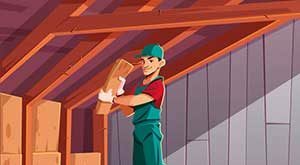 The outer material of the boot should also be made to overcome the abrasive damage from shingles. To prevent slipping on the roofing material, an anti-slip sole is also recommended. Moisture resistance and an anti-slip sole are key in the plumbing industry. The work environment is often wet and dirty. The boots should be easy to clean to ensure that accumulated grime from walking through muck is easy to get rid of. 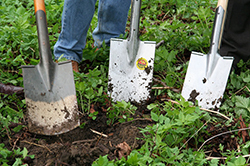 Padded collars and cushioned footbeds are also recommended for workers that are on their feet most of the day. 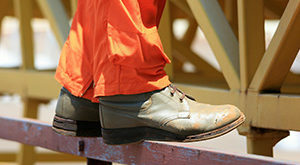 Work boots for painters should include features that add both stability and protection. An anti-slip sole will prevent slips on paint. It’s also good to have waterproofing features and the ability to easily clean the boots in the washer after a day of painting. Boots should also have extra padding and support for to make climbing up ladders all day easier. 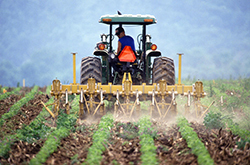 Those working in agriculture need to have ample toe and upper foot protection from the gear and equipment. It’s also a good idea to have anti-slip soles and waterproofing features to ensure that water and mud don’t get into the boots. Because workers are often on their feet for a long time, a shock-absorbing heel is needed as well. To ensure that the feet stay dry in the mud, boots should be water-resistant. They should also have a non-slip sole for stability. To protect from heavy machinery shoes should be made with a material that’s resistant to cuts and abrasive damage. Another great feature to look out for is the ability to clean boots in the washer. Those working with a chainsaw need a lot of protection throughout the foot. Steel toe caps and upper foot shields can stop the spinnings blades. An additional layer of material that’s resistant to tears and abrasive damage is also recommended. 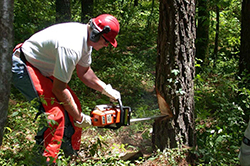 Depending on where the chainsaw will be used, it’s also a good idea to go with anti-slip soles to ensure that falls don’t occur when holding the chainsaw. Truck drivers have to handle heavy cargo and machinery on a regular basis. To avoid injury, it’s a good idea to go with boots that have a durable toe cap and metatarsal shield. Comfortable footbeds with plenty of padding and a shock absorbing design will also help to avoid pains after a long day on the job. Slippery floors from accidental spills and messes are common in both the dining and kitchen area of a restaurant. 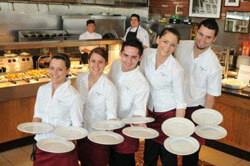 To prevent falling and injury, restaurant workers need to have anti-slip soles. Furthermore, shoes should have an easy-clean design that can be thrown into a washing machine for added longevity. 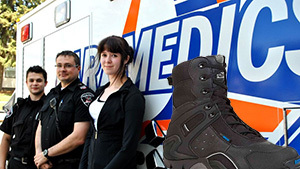 Due to the unexpected nature of EMS work, it’s important to get boots that are well-protected and comfortable. 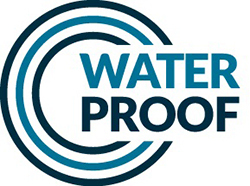 Waterproofing features are recommended to stay dry in variable work environments. Furthermore, protection from biological hazards and pathogens will prevent illness and disease. Boots should also be breathable and easy to clean. Boots for firefighting need to have ample protection from various elements. They should have a solid toe cap to prevent injury from debris. The entire shoe should also be clad in a composite material that doesn’t conduct heat. Other important features should include a shock-proof sole, a waterproof design, and side zipper that makes it easy to put on at a moment’s notice. Welders are exposed to flying sparks and molten metal, so work boots need to be designed with safety in mind. The top portion of the shoe should be snug and secure to prevent hot materials from touching the skin. Quick-release features are also recommended so that it’s easy to remove in a hurry. 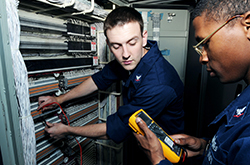 Electricians are exposed to live wires and a dangerous work environment. Work boots need to have an electrical safety rating with a shock-resistant sole. The sole should be made from a non-conductive material like rubber. Additionally, the toe should be protected with a composite cap rather than a steel one. If you’re a construction worker, you understand the toll that a long day at work can take on your body. It’s a physically grueling job that’s surrounded by a bevy of hazards. You have to deal with heavy machinery, slippery floors, heights, worksite debris, and so much more. 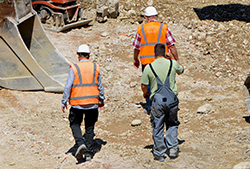 There are hundreds of construction injuries each year. To ensure that you can clock out unscathed, it’s imperative that you invest in the proper safety gear. One of the most important components of your work uniform is your boots. Work boots that are specifically designed for construction workers have many features that can keep you safe. They’re unique to standard boots because they’re made from high-quality materials that can withstand the rigors of daily wear. Best of all, you can choose boots that have the features that are most important to you. 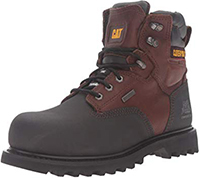 Whether you typically deal with framing walls at incredible heights or you mostly work with concrete, you’ll have no problem finding boots that are built to suit your work environment. 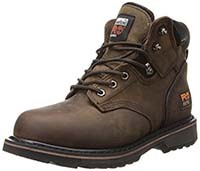 To help you in your search for those perfect boots, here’s a list of some of the best options that were built with construction workers in mind. Timberland is a name that’s synonymous with quality, and with good reason. These boots are full of safety features. The uppers are made from thick nubuck leather. The soles are made from a unique rubber. It’s heat-resistant, slip-resistant, and highly durable. Goodyear welt construction is used to attach the two components, making the final product very strong. Inside, you’ll find a polyurethane midsole that can provide you with all the support you need. There’s also a nylon shock-diffusion plate built into the sole. It can provide you with even more support and comfort as you work. 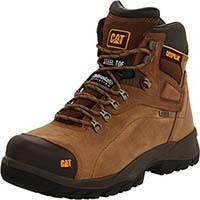 These boots from Caterpillar are completely waterproof, allowing you to work in wet environments with no problem. The interior of the boots is also lined with 200-gram Thinsulate. This unique insulation will ensure that your feet aren’t affected by cold weather. For comfort and support, the manufacturers included an EVA foam insert. It has gel technology and can be removed for easy cleaning. The uppers are made of leather and rise above the ankles. 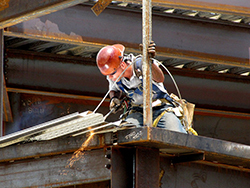 A steel toe cap is built right in for safety. Rubber is used for the soles. They’re also carefully designed to provide you with adequate traction. With its unique sole design, these Thorogood boots are ideal for working on slick surfaces. Rather than a traditional sole shape, these boots utilize a wedge design that maximizes the contact surface area. The sole is made from Vibram and has a wavy traction pattern that can keep you upright. Built into the sole is a fiberglass shank. This shank helps to absorb shock and provide torsional support. Because it’s made from fiberglass rather than steel, the boots are also resistant to electrical shock. The uppers are made of stained leather. There’s also a Poron comfort cushion inside. Another great option from Timberland is this waterproof shoe. It’s completely sealed to keep your feet comfortable. There’s also a moisture-wicking liner inside to help manage sweat and keep you cool. To keep the odors at bay, this lining has an antimicrobial treatment applied. You’ll find a polyurethane midsole inside for support. The rubber soles are made to provide great traction in any environment. They’re slip and oil resistant. The uppers are made of durable textured leather and have a speed-lace system. An alloy toe cap is also included for additional protection. The Highbury boots from Caterpillar are designed with comfort in mind. Inside the boots is a nylon mesh lining. This material works to wick away sweat while helping to promote air circulation. These features can keep you cool even on the hottest work day. Additionally, there’s a Poliyou sock liner. It adds a bit of extra cushion and comfort. The EVA midsole will support your arches and absorb some shock as you work. The outside of the boots utilizes split leather. The boots rise approximately 5 inches from the arch, providing you with great ankle protection. The Endurance line of boots from Timberland boasts a range of protective features. They’re resistant to electrical shocks, slips, oil, and abrasion. The rubber soles are quite thick. An additional layer of rubber is added to the toe to increase longevity. It complements the built-in steel toe. A puncture plate is also used to keep you safe from injury. These boots have anti-fatigue technology that helps to absorb shock and bounce it back to key areas of your feet that need it most. A contoured insole also provides support. Full-grain leather is used on the exterior. 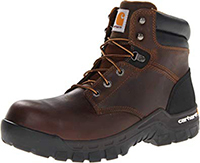 These Carhartt boots offer great durability while providing you with the flexibility you need to work comfortably. Rugged Flex technology is used on the soles so that the boots move with you. The sole design provides traction as you walk while absorbing the force of impact. The thick rubber material is resistant to abrasive damage. They also have ladder lock channels so that you can climb with confidence. An EVA midsole supports your arch. An additional Ortholite insole is also included. It has multiple layers of cushion to keep you comfortable no matter what. The uppers are made of full-grain leather and have a composite toe cap. One of the leading causes of injuries in the workplace for those with wide feet is poorly fitted work boots. While the fit is important regardless of the type of boots you get, it’s even more important if you have wide feet. Standard boots can pinch your feet and cause blisters. Even worse, the protective elements of the shoe will fail to properly protect you. To ensure that you have the protection you need, look out for these features. Pain is felt on the soles and forefoot. It’s the widest part of the foot that can be pinched and blistered with standard shoes. It’s important to find boots that are specifically designed with wider feet in mind. The sole should be large enough to slide your foot into but snug enough to cushion the sole from shocks. The same goes for the forefoot. Injuries from a small toe cap are far too common among workers with wide feet. The toe cap is meant to protect your foot. However, standard caps don’t cover all the toes on wide feet. This could lead to severe crushing and injury should an accident occur. Luckily, manufacturers also create caps that are designed for wider feet. They tend to have a square shape to accommodate all the toes. Your toes should be directly undeath the cap without chafing on the sides. Like toe caps, it’s imperative that metatarsal shields are fitted correctly to ensure that the top of your foot is safe from crushing. Regardless of what material it’s made out of, it needs to extend beyond the natural width of your foot. If you experience blisters from constantly rubbing on the shield, it’s too small. The shield should feel invisible and comfortable. While diabetes affects the entire body, complications often arise in the feet. The condition affects circulation to the lower body, which could ultimately result in life-altering issues. For diabetes sufferers, finding the right pair of work boots is more important than ever. The goal is to find shoes that are comfortable and supportive while minimizing injury to the feet. It’s important to go with boots that are wide in all parts of the foot. Diabetes can cause the feet to swell up, so it’s good to have extra room to prevent constriction. This can help to prevent abrasive injuries and blisters. 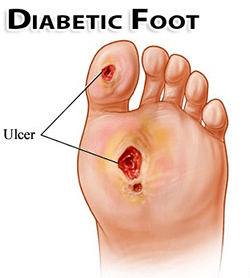 The toes are the most susceptible to injuries for diabetes sufferers. Even the slightest irritation can cause issues. A deeper toe box will provide some extra wiggle room while providing ample protection from accidents. The toe cap should be durable and large enough to encompass all the toes safely. The lining of the boots needs to be soft and free of bumps. Raised stitching can cause irritation and blisters. The lining needs to be smooth and comfortable, especially if the boots are to be worn all day long. The liner should also be treated to have anti-microbial properties. This can help to prevent possible infection. The more padding, the better. Additional cushions throughout the lining and sole of the boots can help to prevent discomfort and irritation. It’s also good to get boots that have cushioned tongue and collar. A non-padded collar can cause abrasive injuries through regular activity. To make the boots as comfortable and non-irritating as possible, the soles should be thick and shock absorbent. A deeper insole that cups the heel will spread the force of impact and prevent jarring pain throughout the leg. For more extreme cases, it may be a good idea to get boots with a sole that rocks. A curved sole replicates the natural motions of the foot, absorbs shock, and provides stability. 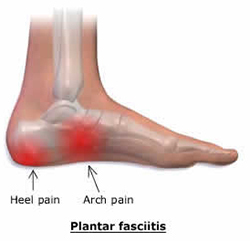 Plantar Fasciitis is a painful condition caused by inflammation of a large connective tendon in your feet. Pain from the condition typically occurs by standing on your feet for prolonged periods of time. It can affect you as you work and long after you’ve left. To help minimize the effects of the condition, you need to choose a boot that’s designed with comfort and support in mind. The condition is irritated when your feet aren’t in the proper position. Because the swollen tendon stretches from the heel to the toes, pain is often felt in these areas. A footbed that’s shaped to accommodate a healthy foot position can relieve strain. 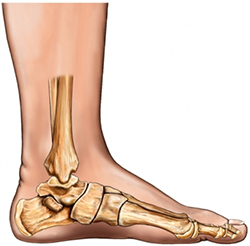 A raised arch will reduce pressure on the ligament. This will result in less fatigue and pain. The insole and outsole should be designed to absorb the shock of moving. This is especially important if you work on hard surfaces like concrete. Walking on a tough surface can send the shock directly into your heel to irritate the ligament. Go with boots that have many shock-absorbing features. The insole and outsole will work together to alleviate pressure as you work. While zippers and straps may be more convenient, nothing beats the security of laces. Boots with laces that extend up the ankle can provide you with the adjustability you need. They make it possible to get a snug fit and prevent your feet from slipping out of the safe position created by the footbed. It’s important to get boots with a balanced height. Higher heels tend to put pressure on the ligament. It throws off your foot position and creates tension. On the other hand, too low of a heel eliminates the benefits gained from a contoured footbed. Pressure will be targeted to the heel and arch. Heels with a medium height create balance and stability. Sweating is completely natural and can help to regulate your body temperature. However, sweating in a stuffy work boot can ruin your work day. Excessive sweating can lead to irritation and bacteria. While boots are known for their thick and durable build, there are ways to keep the sweat at bay. Fabrics like mesh and Gore-Tex are must-haves if you have sweaty feet. These fabrics allow air to enter your boots so that sweat can evaporate. Mesh is typically incorporated into the design through panels. It’s often used on the sides of the boots, on top of the toes, and along the tongue. Gore-Tex, however, is used in the lining. It’s a waterproof membrane that happens to be very breathable. Like breathable fabric, ventilation holes promote airflow to keep you dry. Boot manufacturers will incorporate these holes discretely. They’re just large enough to let air in without exposing too much of your feet to the elements. Boots can get pretty hot as you wear them, even with a bit of airflow. When you throw sweat into the mix, boots become the perfect breeding ground for bacteria. An anti-microbial coating or fabric can help stop bacteria in its tracks. If you have flat feet, you understand the struggles of having to stand on your feet all day. While the condition isn’t life-threatening, it can cause immense discomfort. 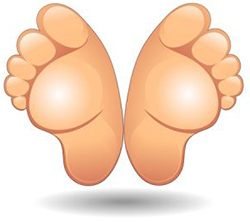 Flat feet occur when the normal arch has fallen. Whether you’ve had the condition since birth or started showing symptoms as a result of age or injury, it’s important to get the right boots that address your unique issues. Here are some features to look out for. Boots can help to create an artificial arch as you work. This arch is located in the very center of the footbed and helps to raise your fallen arch. This improves your foot’s ability to absorb shock and weight as you work. You’ll notice an improvement in comfort and foot fatigue even after you’ve spent all day on your feet. Your boots should also provide adequate support to your sole. Go with a slightly thicker insole that’s firm and durable. It will help to absorb shock further while providing you with a bit of a footrest. It won’t just affect your sole, but also the center of your foot. This extra height and support will work with the raised arch to position your foot in a way that improves function, mobility, and stability. Go with boots that have plenty of padding and gel cushion. While arch and sole support will do wonders for your comfort level, it doesn’t hurt to add a bit more cushion for ultimate comfort as you work. Narrow feet can be difficult to shop for you if you don’t know what to look for. Like with wide feet, it’s important to get shoes that fit correctly and have safety features adapted to the unique shape of your foot. Failure to do so can result in a constant loose fit. Your feet will slide around as you work, resulting in blisters and abrasive damage. Pay attention to the width of the sole and forefoot. These are the most vulnerable areas of your foot that can ultimately affect your overall comfort, performance, and fatigue level. Many manufacturers offer width sizing that goes down to extra-narrow options. Often represented by a letter, these sizes refer to the width of the sole and forefoot. Another great feature to make shoes fit you perfectly is a lace-up closure system. 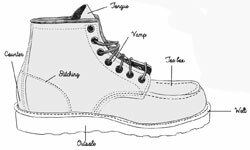 While most work boots have laces, some models have laces that extend from the top of your foot all the way up the shaft. This design feature can make the sides and top of the boot come in for a snug fit. Typically, cushions and pads can make the overall lining thicker. Go with boots that have a thick layer of comfort padding. Not only will extra cushions help to provide you with a tighter fit, but they’ll also help to prevent blisters from forming. If you work in a colder environment, there’s an additional set of obstacles you have to overcome to remain comfortable and safe. Shoes need to be able to keep your feet insulated. They should be thick enough to keep the cold out while also providing you with the protection and stability you need to perform your job. Whether you’re working in a cold facility or out in the snow, there are a few different features you should look out for. Work boots made for cold environments incorporate thick insulation throughout. The insulation prevents cooler air from entering your shoe while also preventing your natural body heat from escaping. Manufacturers provide different ratings based on the amount of insulation a shoe has to give you a better understanding of the protection the boots offer. 200 grams of insulation material is great for standard winter temperatures down to 30 degrees Fahrenheit. 400 grams of insulation provide a bit more protection. They can keep you safe in the same temperature range as 200-gram insulation. However, it’s designed for workers that don’t move around. Between 800 and 1000 grams of insulation provide the most protection from the elements and are designed to keep you safe in anything lower than 30 degrees. Another thing to look out for is composite, nylon, or fiberglass material. Instead of going with steel toe caps, opt for composite. The material doesn’t transfer temperature like steel does. The same goes for shanks. Nylon or fiberglass shanks can provide you with the support you need for the job without making you colder in the process. If there’s one thing that can bring your temperature down or cause hypothermia, it’s moisture. Melted snow or ice can easily seep into a standard work boot. Those made for cold environments should have a sealed design. There shouldn’t be any access point or vulnerable spots. Durable waterproof materials and design are key to staying safe. If you’re working outdoors in a hotter climate, you’ll instantly feel the effects of poor boot choice. 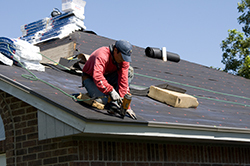 Whether you’re a roofer or work in construction, long hours in the sun can be difficult and very tiring. While it may not seem like much, a few comfort features in your boots can help you work harder and prevent fatigue after you clock out. One of the most important features you need to look out for is ventilation. Mesh panels and circulation holes promote airflow throughout the boots. The ventilation design is often discrete as to not sacrifice durability and safety. It can make your boots breathable and work to help prevent sweat. The design regulates the air temperature inside your shoe for maximum comfort and safety. Ventilation holes and mesh work in tandem with moisture-wicking fabric. This unique fabric is used to line the inside of the boot and footbed. Instead of soaking up your sweat and causing discomfort, the fabric uses the natural airflow to promote evaporation. When you’re working in wet conditions, your main priorities should be safety and comfort. Wet floors are a leading cause of workplace injuries. Beyond that, you need to be able to protect your health by avoiding wet feet and bacteria growth. There are a number of features to look out for when choosing boots for wet environments. First and foremost, you need to get boots that are completely protected from moisture infiltration. There’s nothing more uncomfortable than soggy socks and a persistent squishing sound as you walk. Waterproof boots are completely sealed. The various parts of the shoe are adhered tightly and reinforced to prevent water penetration. Some boots also come with a removable liner to make them more manageable in the workplace. 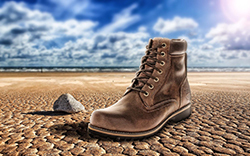 The two most common materials used for waterproof boots are rubber and leather. Rubber repels moisture and is pretty resistant to minor abrasive damage. Some manufacturers use rubber for the upper portion of the boot to accommodate those that may have to walk in deeper waters. Leather is also a great material because it’s naturally resistant to water. Manufacturers will implement some extra precautionary measures to ensure a tight seal. This special lining will help to keep bacteria at bay. They often utilize natural agents, such as silver, to prevent the growth of bacteria. As a result, your boots are easier to take care of and much safer on your feet. The linings fight off odor-causing bacteria, leaving your boots free of smells and helping you avoid foot fungus. Slip resistant soles are a must-have if you’re constantly around water. Special designs on the sole are created to redirect water away from the boots with every step. Falls occur because a thin layer of water prevents you from making contact with the floor. Anti-slip soles help to provide grip at key points along the bottom of your shoe for support and traction. As you search the market for that perfect pair of work boots, you’re likely to come across a number of strange symbols and markings. They’re typically placed on the box and even on the shoe itself. These symbols aren’t just for show. 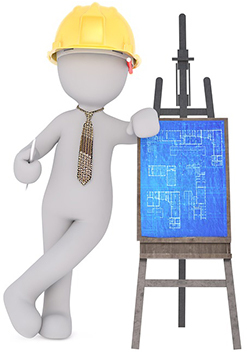 They represent safety codes and classifications. They’re meant to give you an idea of what type of safety features the boots hold. While these marking may be confusing at first, it’s important to understand what everything means to ensure that you get boots that can keep you protected on the job. Above all else, your boots need to comply with basic safety regulations. These regulations are put in place by a few different governing bodies around the world. 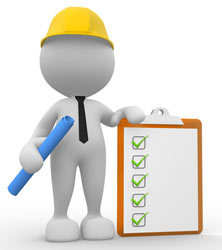 All safety work boots must comply with the minimum requirements. 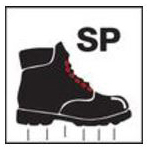 Depending on where you are in the world, boots will comply with PPE, CSA, or ASTM standards. 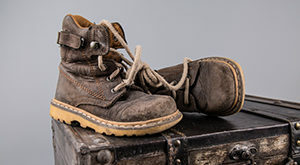 The International Organization for Standardization, or ISO, also has a set of current standards that work boots must legally meet. This standard is called EN ISO 20345:2011. Electric shock protection Working around live wires and electrical conductors. Resistance decreases over time and if in a wet environment. 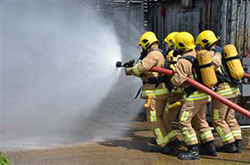 Static dissipation Working around combustible fuels or equipment that can be damaged by static electricity. 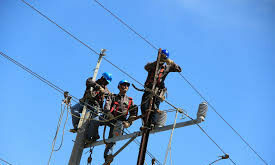 Boots shouldn't be worn around live wires and electrical conductors. Puncture resistance, a "Grade 2" toe cap, and extra static dissipation Working in industrial environments with debris, combustible fuels, and hazards that can be affected by static electricity. Boots shouldn't be worn around live wires and electrical conductors. Electrically conductive Working in environments where electrical changes can harm workers and equipment. Boots shouldn't be worn around any live wires or electrical conductors. While some of these design choices are a matter of preference, they can also affect the boot’s ability to keep you comfortable and protected. The way boots are put on and secured can affect its comfort and fit. Manufacturers can utilize a few different closure designs to make boots more convenient. Some even combine these designs to provide you with versatility. Also referred to as slip-on boots, these options are known for their convenience. They’re quick to pull on and take off. There’s no fiddling with laces or other closure systems. However, their downside is that many slip-on boots remain loose. They have to have a bit of extra room around the ankle to accommodate your foot slipping in. Most boots contain laces. The laces allow you to get a snug fit each time you put the boots on. Some models have a lacing system that extends quite far up the boot. Depending on how long the laces are, these boots can require a bit of time to put on. However, their added security is well worth it. Zippers can be used to provide you with flexibility. They’re often included as a secondary option alongside laces. Straps may also be placed along the collar of the boots to secure the top. Zippers are usually located on the side of the boot and run up your ankle. They can make putting on the boots easy without sacrificing the fit you get from the laces. The upper material refers to the exterior of the boot. It’s the part that’s exposed to workplace hazards and play a big role in the safety of the boots. They’re the first line of defense from accidents. Some of the most popular boots on the market are made from leather because of its durability. High-quality leather is naturally waterproof and thick enough to withstand some wear and tear. While the material may seem uncomfortable at first, it becomes more pliable after it’s broken in. Once that break-in process is over, you can expect a custom fit that works around the unique contours of your foot. Also referred to as wellingtons, rubber boots are great when you’re working in wet environments. They’re completely sealed and virtually impenetrable by water if they’re in good condition. Thick rubber is also pretty resistant to abrasive damage. Furthermore, the material is easy to clean with a simple rinse. The only downside is that they don’t conform well to the shape of your foot and can be rather loose around the ankle area. Synthetic materials offer great durability at a fraction of the cost as leather. Synthetic leather, while not as waterproof, can stand up well to the rigors of daily work. Nylon is another great option that’s typically more comfortable to wear. Nylon boots are lighter and often made with mesh panels for breathability. The soles of your boots keep the bottom of your feet protected. They work with the uppers to protect you from all angles. Soles can also affect how your feet are supported. Rubber is a great material for soles. It provides traction on a number of different slick surfaces, making it naturally slip-resistant. Furthermore, rubber is resistant to abrasive damage and oil for durability. Many manufacturers include other materials into the rubber for additional benefits and better durability. Ethylene vinyl acetate is often used on boots that are designed to tackle pain and stability issues. It can be used to construct soles that have different levels of softness throughout. Doing so manipulates the way weight and pressure are spread throughout the sole as you walk. It’s often used for boots that need to be light and flexible. Thermo-polyurethane is very strong, but also lightweight. It’s a hardy material that can withstand abrasive damage, splitting, light punctures, and chemical damage. These soles are easy to spot due to their distinct stripped look. This is a result of the manufacturing process, which involves stacking layers of hard and soft material. The vertical portion of your boots is also referred to as the shaft. Heights are generally separated into three categories, though manufacturers create boots with a range of specific measurements. These boots closely resemble a traditional shoe. Some manufacturers choose to place the collar just under the ankle while others cover it slightly. The benefit of ankle boots is their flexibility. Your ankles aren’t limited, so you have complete mobility. They’re great for workers that need to make agile movements on the job. Mid-calf boots are fairly common. As the name implies, they extend beyond the ankle and end on the calf. The main benefit of a longer shaft is increased protection and stability. Mid-calf boots can keep part of your leg safe from debris, molten metal, and much more. If your work pants are tucked into the boot, you’re essentially sealing your leg off from harm. Additionally, longer shafts keep your ankle stable. They can prevent your ankle from giving out as you move through the workplace, preventing sprain injuries. If you’re looking for the most protection possible, knee-high work boots are your best bet. They extend 12 inches or more above your ankle, often ending just below the knee. They protect most of your lower leg while also keeping your ankle stable to avoid injury. Toe protection, metatarsal guards, and sole plates all work to keep you safe from the many hazards you may face. Toe caps are fairly common, but additional protection is also available. These guards come in a number of different materials. 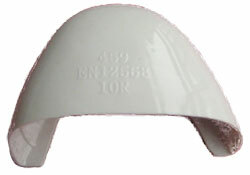 Steel toe caps and guards are very common because of their strength and durability. They can hold up well to minor accidents and help save your foot in larger ones. However, they should never be worn in areas exposed to electricity or extreme temperatures as its a conductive material. Steel is also quite heavy and cumbersome. Composite protection components are a lighter alternative to steel. Because they’re not made from metal, they can be used in virtually any workplace environment without worry. They’re made from a variety of different materials like kevlar, carbon fiber, and more. Some manufacturers even combine the materials to take advantage of different properties. 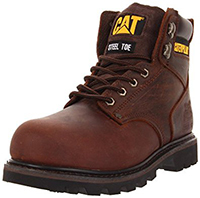 These work boots are ideal if you work in wet or cold environments. It has a carbon max toe cap with an ASTM rating of I/75 and C/75. It’s resistant to both abrupt impacts and compression. The uppers are made of a waterproof leather. The toe area has some added protection against abrasive damage for good measure. In terms of comfort, these boots utilize an athletic Contour welt construction method. This unique design moves with your foot. It has specific flex points that can improve traction and overall comfort as you walk. Inside, you’ll find an Ortholite cushioned footbed. The outsoles are slip, oil, and water-resistant. It’s also resistant to chemical damage. From Carhartt, these boots are designed to provide you with the protection you need without having to sacrifice comfort. Many unique features are included to reduce fatigue. These include a dual-density footbed, an Ortholite top layer, and Strobel comfort cushioning. An EVA insert with a built-in steel shank is included. It provides rigidity as you walk. The composite toe cap is extra roomy. It has space to move your toes while meeting ASTM safety standards. The uppers are made of oil-stained leather and are attached to the Rugged Flex outsole with cement. With multiple layers of water protection, these boots from Timberland have you covered in any work environment. 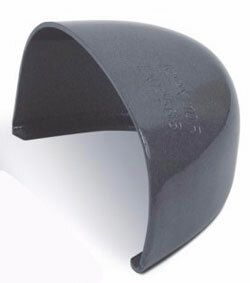 The included composite cap is durable and meets ASTM electrical standards. It’s covered by waterproof leather and an additional layer of rubber for added protection. Inside the boots are a waterproof membrane and antimicrobial lining. The lining is designed to prevent bacterial growth and offensive foot odors. Anti-fatigue foam is placed on the footbed. This material absorbs shock so that you can work harder for much longer. A fiberglass shank is built into the outsoles for further rigidity and electrical protection. 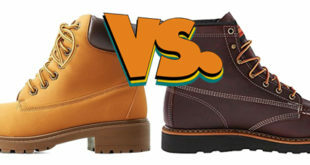 Timberland is a brand that’s known for their innovative boot designs. The Titan is one of their most popular offerings because of its superior protection and comfort. A composite safety toe is seamlessly integrated so that you’ll never even notice that its there. It’s made of a high-strength alloy. The cap is accompanied by an antimicrobial lining and breathable mesh for ventilation. The outside of the boots are covered in a soft full-grain leather. It’s designed to be pliable from the start so that you don’t have to go through a lengthy break-in period. The Caterpillar Creston boots will make you prepared for anything work has to throw at you. The composite toe cover is covered by the brand’s unique Tectuf material for added durability. In addition to impact and compression resistance, the cap provides electrical hazard protection. The outside of the boots are made from top-grain leather and use a waterproof membrane construction method to prevent moisture from getting in. If you work in a cold environment, you’ll be happy to know that 200-gram Thinsulate wraps around your feet so that you can stay cozy. The term “composite” isn’t used to represent a single material. Instead, it’s used more like an umbrella term to describe many types of synthetic materials. A composite substance is made by combining multiple different components. When combined, the final outcome is a brand-new substance that’s completely unique. For toe caps, the composite materials used can vary from manufacturer to manufacturer. They don’t contain any metal, therefore, they’re light and non-conductive. Some common materials used include fiberglass, Kevlar, carbon fiber, and plastic. Despite being light, composite toe caps are capable of withstanding a lot of impact and pressure. Most are a bit thicker around the toe cover to prevent damage upon impact. There’s a reason why composite toe caps have grown in popularity. They take the many great features of standard steel toe caps and expand upon them to give you more versatility and safety. One of the biggest complaints about steel toe caps is that they add significant weight to the overall boot. While it may not seem like a significant difference when you first put them on, you’ll feel the effects at the end of the day. Heavier boots require more energy to move. This can result in more fatigue earlier on in your workday. On average, composite toe caps weigh 30% less than their steel counterparts. You get the protection without all of the added bulk. Composite materials aren’t affected by the weather outside. This is beneficial if you work in extreme heat or snow. Steel is a conductive material. It doesn’t take long for the temperature outside to make its way to your toes. With a composite toe cap, you don’t have to worry about that. Your toes can stay comfortable and cozy no matter what the weather is like. If you are an electrician or work around live wiring, boots with composite toes are the way to go. Many options are rated to fit ASTM standards for electrical shock. Because they contain no metal, these types of boots will keep you grounded. Typically, electrical hazard boots with a composite toe can keep you safe from an electrical jolt up to 6,000 volts. Many industrial sites are equipped with metal detectors at the entrance. While your coworkers with steel toe boots will have to take their footwear off for a manual inspection, you can walk on through with no problem. There are many things to look out for when you’re shopping for the perfect pair of work boots. It’s a good idea to match the features of a pair of boots to your specific work environments. The market is vast, so you’ll have no problem finding something that works for you. The main goal of a composite toe cap is to provide protection against impact. 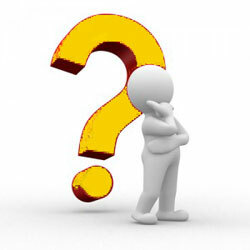 Many options have specific safety ratings that let you know how much protection a product offers. Impact resistance refers to the boots’ ability to withstand significant force or shock in a short period of time. Hazards like falling objects or accidental kicks to heavy machinery fall under this category. Look for the ASTM sign of approval. These boots undergo heavy testing for compliance. Go with boots that pass or exceed ASTM standards. Compression resistance refers to the product’s ability to a heavy load for extended periods of time. When excessive pressure is applied, many materials will get smaller or stretch out because the limits of the tensile strength have been reached. This happens with even the hardest material, including steel. The composite material used for toe caps is specifically built with a high tensile strength in mind. ASTM compression can vary. Most ratings indicate just how much weight the cap can handle. A C/75 rating can take up to 2,000 pounds while a C/50 can withstand up to 1,750. Beyond the material of the toe cap, you’re going to want to pay attention to the rest of the materials used on the boots. A pair of boots will only provide you with adequate protection if they can hold up to the rigors of daily wear. One of the best materials is leather. Leather is naturally resistant to water penetration. Additional treatments can add even more barriers against abrasive damage and more. For the soles, rubber is a great option. Not only does it hold up well against rough surfaces, but it also absorbs some of the force of impact as you walk. Comfort is key when you’re on your feet all day. This is especially true if there’s an additional layer to worry about. With traditional steel toe boots, it’s not uncommon for the material to cause some discomfort against the skin. Composite caps are generally more comfortable to wear. You can also get boots with some extra features. A soft lining will prevent chaffing as you walk while insoles provide arch support throughout the day. Work boots are meant to protect you from whatever your job may throw at you but they can only do that if they fit your needs. It’s still important to take every precaution to ensure that boots fit correctly and have the features that you need to stay comfortable and safe. Beyond the obvious work hazards, there are a number of common foot problems that workers face. Most of the time, these problems are easily avoided. 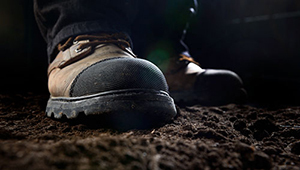 All it takes is a bit of knowledge and extra consideration while choosing the right work boots. While minor, these issues can affect your overall health, comfort, performance, and safety. All of these issues can be avoided by choosing shoes that address your specific fit, environmental needs, medical conditions, and work environment. 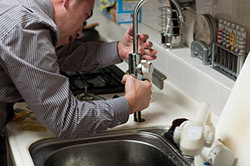 There are also a number of precautions you can take while you’re at work to avoid problems. While these issues aren’t immediately dangerous, they can be pretty painful and lead to a host of significant problems if they’re not dealt with. When you get home from work, hold off on relaxing for a moment and give your boots a quick cleaning. If your boots have accumulated dirt or grime throughout the work day, you need to get rid of it. Leaving it on will only cause the materials of the boot to deteriorate faster. Use a damp cloth with some water to wipe your boots clean. Alternatively, you can rinse heavier messes off with the hose. This only applies if you’ve walked through snow and salt. 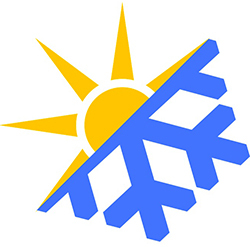 Salt is often used to improve traction on icy surfaces like sidewalks and roads. Unfortunately, salt can quickly deteriorate materials like leather. To get rid of it, mix two parts of water with one part of vinegar. Then, dampen a towel and dissolve leftover salt you can’t see. After that’s done, use a cloth to wipe away excess solution and leave your boots to dry. You should never leave your boots out in the elements. Instead, keep them in a dry and well-ventilated area. This will help speed up the drying process after you cleaned them off. Not only that, but dry storage can help to evaporate sweat in the liner and prevent bacterial growth. If you want to go the extra mile, invest in some cedar shoe trees. The cedar wicks away moisture while giving the boots a nice scent. They’ll also help to retain the shape of boots. Boots should be cleaned thoroughly at least once a month to preserve the quality of the material. This is especially important if your boots are made from leather. Before you start cleaning, remove the laces and liner. Then, use a stiff brush to get rid of dried dirt and grime. Make sure to clean both the uppers and the sole. The way you continue cleaning will depend on the material of your boots. If you have a non-leather boot, you can use a water-based cleaner. Mix your cleaner with some more water and use a damp cloth to apply it to your boots. If you’re dealing with stubborn stains, you can also use the brush in circular motions. Once it’s fully covered, rinse the boots off and let them dry. With leather, it’s important to get a moisturizing cleaner. Standard cleaners can dry out the leather and cause it to crack. Simply dampen a towel with the solution and gently rub the boots clean. Leather boots require a bit more care than other materials. The natural material is very porous and prone to drying out. To make sure that the boots stay supple and safe, you need to condition them and apply a waterproofing product. Leather is a lot like skin in the sense that it gets discolored, wrinkled, and dry as it ages. To prevent this, it needs regular moisturizing. The process is fairly easy and can help to make the material more flexible. There are a number of products you can use. Options like mink oil, saddle soap, and conditioning cream are fairly easy to find. You can use a cloth to apply the product to the boots thoroughly. Make sure to get into seams and any creases that may have formed. Rub the solution in so that the leather absorbs it fully. If any excess is left over, you can remove it with a dry rag. While manufacturers apply a waterproofing coating, it can fade over time. You need to apply a solution after cleaning. Wax, sprays, and creams can be used. Pay attention to the directions of the product. Some waxes require you to apply it to the boots when they’re wet while other need the boots to be dry. You can apply a few coats to get the desired level of water protection. If the product leaves a haze, simply use a stiff brush to rub it off once the product has dried.